Multi-antenna techniques are widely considered to be the most promising avenue for significantly increasing the bandwidth efficiency of wireless data transmission systems. In so called MIMO (multiple input multiple output) systems, multiple antennas are deployed both at the transmitter and the receiver. In MISO (multiple input single output) systems, the receiver has only one antenna, and the multiple transmit antennas are used for transmit diversity. The key aspects of multiple antenna transceiver techniques for evolving 3G systems and beyond are presented. MIMO and MISO (transmit diversity) techniques are explained in a common setting. In particular, the book covers linear processing transmit diversity methods with and without side information at the transmitter (feedback), including the current transmit diversity concepts in the WCDMA standards, as well as promising MIMO concepts, crucial for future high data rate systems. As an example, MIMO and MISO aspects of 3GPP HSDPA (high speed downlink packet access) will be considered. Furthermore, examples of high throughput, low complexity space-time codes will be provided, when signalling without side information (open loop concepts). The theory of linear space-time block codes will be developed, and optimal non-orthogonal high throughput codes will be constructed, both for MIMO and MISO systems. Performance may be further improved by feedback from receiver to transmitter. The corresponding closed loop modes in the current 3GPP specifications will be discussed, along with their extensions for more than two transmit antennas. In addition, feedback signalling for MIMO channels will be addressed. Optimal quantisation methods of the feedback messages will be discussed. Finally, hybrid schemes are constructed, where the amount of feedback is reduced using partly open, partly closed loop signalling. For Research engineers in academia and industry, and development engineers in 3G system design as well as research students. Ari Hottinen is the author of Multi-antenna Transceiver Techniques for 3G and Beyond, published by Wiley. 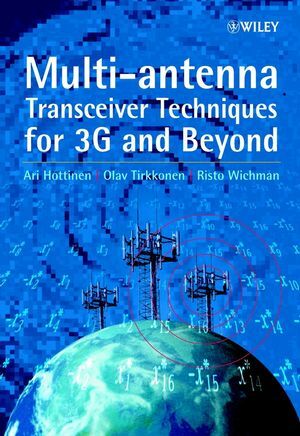 Olav Tirkkonen is the author of Multi-antenna Transceiver Techniques for 3G and Beyond, published by Wiley. Risto Wichman is the author of Multi-antenna Transceiver Techniques for 3G and Beyond, published by Wiley. Diversity Gain, SNR Gain and Rate Increase. Matrix Modulation: Low SNR Aspects. Increasing Symbol Rate: Quasi-orthogonal Layers. Matrix Modulation: High SNR Aspects. Robust and Practical Open-loop Designs. High-rate Designs for MIMO Systems. Closed-loop Methods: Selected Multi-antenna Extensions. Hybrid Closed-loop and Open-loop Methods. Appendix A: Symmetries, Invariants and Inequalities. Appendix B: Matrix Representations of Clifford Algebras.